The meme above is from the “boards”, of course, and there is no question about the aura of confidence within the White Hat circles of late, despite the relentless hammering by the criminals to vilify those opposing them; Trump and Kavanaugh in the crosshairs. We’re getting the distinct impression that something big is about to unfold, with deadlines given and then delayed, in a coordinated plan to make staggering moves against the deep state they cannot recover from. To see the latest QAnon drops, click the link. Plenty of activity. Would it be extreme to call the current status of world affairs a “crisis”? I think not. We hear of a brutal terrorist attack on a military parade in Iran which speaks volumes. We have a Russian plane shot down with troops on board and Putin refusing to take the bait and risk starting WWIII—which is precisely what the deep state wants and needs to survive so they continue the provocations. It’s critical that cool heads prevail and players stick to the plan. 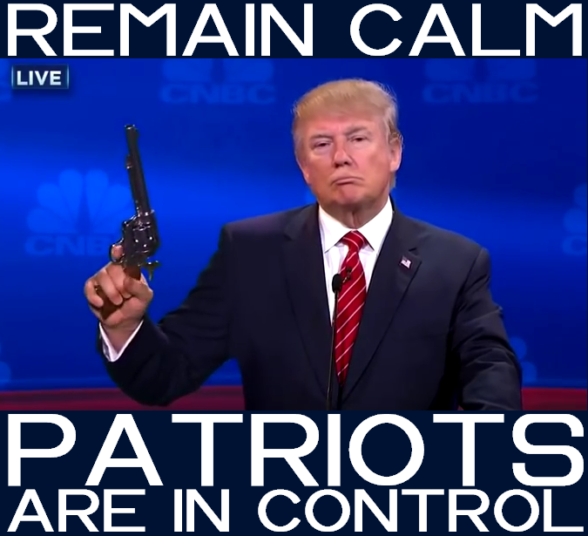 As Q has said, stay calm, and don’t allow anyone to provoke you. We need to act, not REact. We have the latest edition of RT’s CrossTalk on”Crisis Politics” below. The panel tackled several key issues including the sewage surrounding the Judge Kavanaugh character assassination attempt and it’s always a lively discussion with Lionel on board. One of the most salient points came from Peter Lavelle who reminds us that the point of the Kavanaugh hearings and six FBI investigations are to determine if Kavanaugh is fit and qualified to sit on the Supreme Court; not to determine if he is a flawed Human Being. The vague recollections of Blasey-Ford from 35 years ago should not have a final word in the determination as to whether Kavanaugh is the man for the job—particularly when 75 women have come forward in support of Kavanaugh’s character and his treatment of women historically speaking. It’s the same old, same old. The deep state bad actors throw accusations around with zero proof to cast doubt on the character of their enemies, and then the press repeats the chants for the witch hunt relentlessly in hopes that if they say it often enough that their incantations will somehow conjure up reality. In the age of Trump, political gridlock has been taken to the next level. There is a lot at stake – a Supreme Court seat and presidential prerogatives. In the end, it is about the rule of law and equal application of the law. We are gazing into the abyss with compromise unlikely. CrossTalking with Lionel, Jen Kerns, and Don DeBar. Take a look at these latest headlines. The bad news for the deep state continues to surface. Man, when Q says, “These people are stupid”, he isn’t kidding. Unbelievable. Could it get any clearer what this entire scam is about? McConnel _ N E V E R _ deceives about vote counts he has. If he said it, then he’s got the votes. “President Trump has nominated a stunningly successful individual. Democrats Could be HELD in Senate Session through OCTOBER – Can’t Campaign! Senate Majority Leader Mitch McConnell hinted today that he has not appreciated Democrat efforts to obstruct normal Senate operations and now, they may face a TERRIBLE retaliation: Being held in Washington with the Senate “in-Session” until late October. “ Our friends on the other side who have a number of incumbents running for reelection this year are going to want to recess,” McConnell said at the Values Voter Summit, an annual gathering of conservatives in Washington. “It won’t surprise you that I’m making my list and checking it twice,” McConnell said. If McConnell were to hold the Senate in session at the end of October, it could keep more than two dozen Democrats who are defending their seats this year off the campaign trail in the final days before voters head to the polls. Fortunately, many faces are bringing the truth to the world about the massive degree of control through deceit. Tucker Carlson jumps on the band wagon to expose Google and their manipulation of data like they run the world. It’s shocking what they have been getting away with—and still are. They are public enemy No. 1. QAnon states we are at the “precipice”. Interesting terminology. I know I’m on the edge of my seat. Some of the tactics by the opposition to suppress the support of Trump are shockingly brazen, like refusing to allow people entry to a rally if wearing a Q t-shirt. Check out the photos and video at the link above. That Trump Train just keeps getting longer and longer, doesn’t it? There were estimated 20K in line for the venue with 11K capacity and some folks camped out over night. Dustin Nemos brings us the latest QAnon drops and their significance. 9.22.18 – ℚ: ‘We are at the Precipice.’ – The Rats are Turning on Each Other. LL Recorded RR? !!! So… where are the unredacted FISA documents? The deep state stands in direct opposition to the orders of the President to release them. It’s now Saturday and we see nothing. In the video below, Devin Nunes explains, and in no uncertain terms states the media is complicit in the plot to remove the President. If POTUS can’t make the incriminating conspiracy documents public, it’s difficult to clear himself of the wrongdoing he’s been wrongfully accused of by the Democrats and their propaganda arm, the treasonous media. Something has to give. The real proof of a conspiracy continues to ooze forth, however, and the perps are squirming. A new report indicated that Rod Rosenstein discussed secretly recording President Trump and possibly invoking the 25th Amendment against him. An incredibly shocking new report in The New York Times has some details about Deputy Attorney General Rod Rosenstein that will no doubt send shockwaves throughout Washington. According to the Times, in the chaos that followed President Donald Trump‘s decision to fire James Comey, Rosenstein talked about secretly recording the President of the United States. Tom Fitton uses the “C” word (crisis) again in his weekly update and suggests people take action and contact their senator to urge them to ensure the Rule of Law is enforced in America with respect to the current circus to disqualify Judge Kavanaugh. We’ve even had “anonymous sources” contact alternative news vloggers telling them Kavanaugh protects pedophiles. If that’s true, where’s the proof? If the X22 Report resonates with you, Dave brought us two new updates for the financial system status and geopolitical and QAnon decodes which I believe Dave does particularly well. Amusing update. Good for Texas! This entry was posted in Uncategorized and tagged Christine Blasey Ford, crisis, Crosstalk, data, deep state, Devin Nunes, DOJ, FISA warrants, Google, Hillary Clinton, Iran, Israel, Judge Brett Kavanaugh, Judicial Watch, Lioinel, love, manipulation, massacre, McCabe, media, military parade, obstruction, patriots, President Trump, Press, propaganda, QAnon, released, Rod Rosenstein, Russian plane, school curriculum, Sexual assault, shot down, spying, Starship Earth, stonewalled, Syria, terrorist attack. Bookmark the permalink.